Reported by Chrystian Kretowicz (28 Dec 2008) at another site which had stolen it from Victor. Victor quotes http://www.bsu.edu.ru:8805/num487/default.htm as an authority for the flag. This flag shows the same colors as the republic flag (and notably uses the officially prescribed dark red), along with the hop leaves also shown in the republic CoA, making the tips of five thin horizontal red stripes, on yellow background. Script capital letters give the acronym in Chuvash "ChPU" (for "Чӑваш Патшалӑх Университечӗ"), centered above the stripes, and in Russian "ChGU" (for "Чувашский Государств енный Университет"), below. The middle letter in both inscriptions is slightly raised. Yakovlev Chuvash State Pedagogical University (in Russian: Чувашский государственный педагогический университет им. И. Я. Яковлева, in Chuvash: И. Я. Яковлев ячӗллӗ Чӑваш патшалӑх педагогика университечӗ) focus primarily in the education of future middle and high school reachers, especially in the areas of Language and Literature, Physics, Agro-Sciences and Plastic Arts. 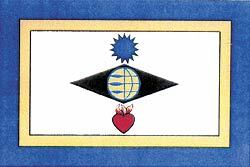 While its CoA-like Emblem emphasizes these four aspects (see it at the official page), its flag, thankfully, does not (large image: "http://www.chgpu.edu.ru/images/simvols/flag.jpg" [dead link]). It has horizontal stripes the upper one being much larger, with a central element protruding from these bottom stripes and surrounded by eight pointed hemiorthogonal stars (just like the flag of Chuvashia itself). The stripes are, from the top, white-blue-yellow-red in approximate widths of 27+2+1+9. 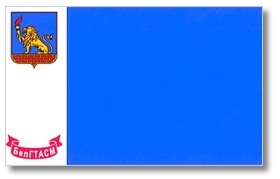 The three bottom stripes have an orthogonal notch in the middle from which two symmetrically placed blue paralellograms (with their parallel sides upright) protrude suggestion an open book. Above and partly between them a large yellow eight-pointed hemiorthogonal star with a central tilt-square hole and red fimbriation and on both sides two more but maller and unpierced such stars. The history of the University begins in 1906 when Higher Commercial Courses of M.V. Pobedinski were arranged in Saint Petersburg. In 1919 the courses were altered into Institute of National Economy and in 1930 the Leningrad Institute of Engineering and Economics was set up. 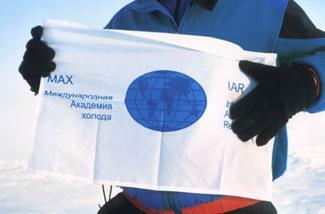 In 1992 the Institute received the Academy status and in 2000 the Academy became the University. More than 21,000 students, including those from Africa, Asia and Europe; 10 faculties in different fields of economics and management; 16 branches and 2 representatives offices in Russian Federation Multidisciplinary advanced professional training; Fundamental and applied research in technology, economics and management.